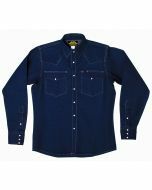 These heavy duty work shirts are primarily used by welders, pipe fitters and field workers. A well kept secret is their appeal for hunters, fishermen and even skiers. They all know that the durability, wind resistance and the double pockets make them ideal for outdoor sports.